Checkout this advertisement from the Sunday paper. 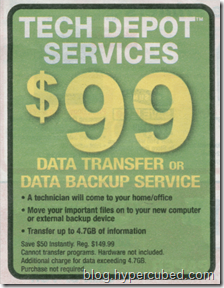 Data transfers or data backup services for $99! This is a giant rip-off. Look at the caveats. "Cannot transfer programs". That means they are not copying your whole hard drive but simply some files from one computer to another. But wait... "Transfer up to 4.7GB of information". Why 4.7GB? Well because that is the size of a single DVD. 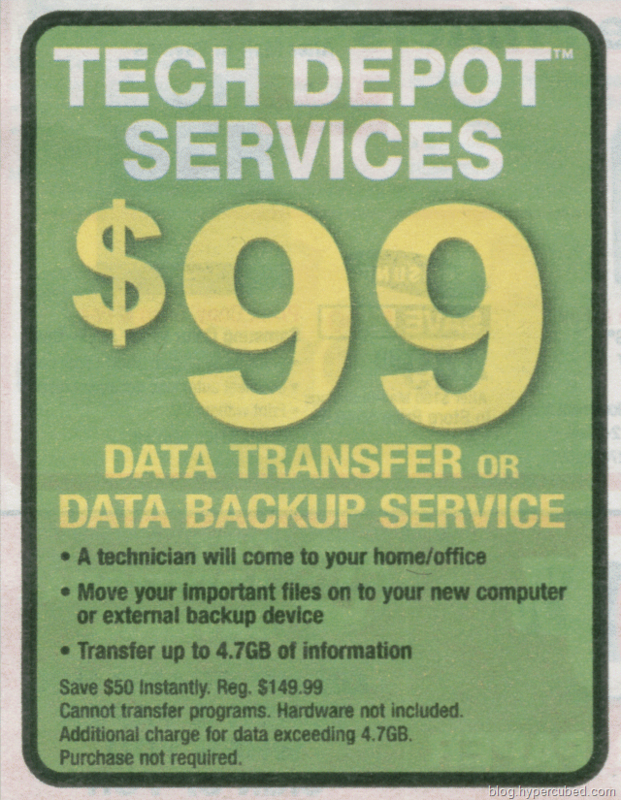 So for $99 they come to you home or office, copy your My Documents folder to a DVD, then copy that DVD to a second computer. If the transfer takes more than one DVD it will cost you extra money. For that price you can buy your own 18X Internal DVD Drive plus enough DVD media for 600 GB of data or better yet by a 300 GB USB 2.0 External Hard Drive for $20 more. This reminds me of the time I noticed a woman at the service center of a major retail computer store picking up a repaired PC. I noticed her because it was the same PC that I owned in the late 90’s (HP 85 something). Standing in ear shot I could hear that she had extra memory installed in the machine. If I recall correctly that machine needed PC100 memory and must be installed in matching pairs. Let’s say she put in two 256 MB chips. These cost at least $40 each for each 256 MB chip. The service charge for that place is $100 minimum. So this poor woman paid at $180+ to maintain a 10 year old machine. You can buy a new computers for $200 - $300. What a rip-off! Remember: friends don't let friends use retail PC repair shops.